Social media will play an even bigger part in our lives and in our business success during 2015. What happens on online and how you control it will play a massive role in the future success of your business. Social media will be at the heart of every successful small business. Of course, that’s fairly common knowledge and everybody will be looking to be better online in business this year and almost everybody will look to social media for that success in 2015. So how do you stay ahead of the crowd? Follow these six approaches that are likely to be among the big trends in social media in 2015 and however big or small your business you can be a trailblazer this year. Visuals have more impact than text, and video can be even more effective than a photograph or funky graphic. With the improvements in smartphone technology almost anybody can record quality video and upload it with relative ease. 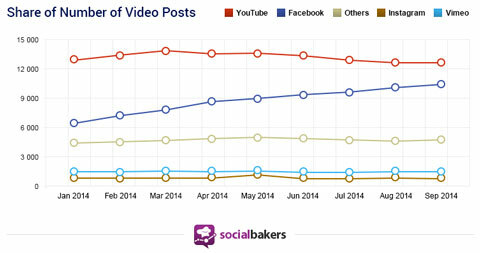 YouTube rules the roost in online video, but as the below graph from Social Bakers shows Facebook is catching up – at least when it comes to the number of times a video is shared. With Facebook also the social network of choice, ignoring its love of video would be business suicide. “But I’m a small business” is no longer an excuse, these opportunities are open to all – If you have a smartphone or tablet, then the chances are you have what it takes to start filming and uploading video – even a humble webcam may be good enough. You can learn more about getting starting with online video marketing here. The competition for eyeballs is ever increasing. People embrace social media because it is fast and instant. Social media are real-time live streams about the world around us. People use them as a way of channelling and revealing their reactions, so the clever businesses are those that use social media in the same way. Most of the big events on social media can be predicted well in advance – such as big sporting events, TV soap storylines and even holiday seasons. Thinking real time goes beyond just agile marketing, it is about having certain prepared responses and thinking on your feet to post responses that fit the mood. Again, this does not exclude small businesses. If you are organised, prepared and have your tools in place you can play the real time game too. With people spending more time online, more of their interactions are going to be taking place online, so there is a growing need for an almost 24/7 monitoring of moods and trends. In 2015 Social listening will be just as important for brands as responding to direct customer service enquiries, so make sure you include it as part of your regular routine. Monitor keywords relevant to your brand and topics relevant to you so you can also react to comments where users haven’t directly mentioned you with an @. Facebook is a constantly evolving beast. Use it and get to know it. Understanding at least the day to day essentials is key if you are to use it successfully in business. Organic Facebook reach is ever dwindling for businesses, but the platform will be rolling out calls to action within the top of Facebook pages this year, so that’s a free tool you have to make sure you are using. You also need to get creative – creative businesses and posts will get noticed. Did you know you can now play video and audio straight from your Twitter stream? No special licence, no inflated premium, just a plain old basic twitter account. Just insert the link. This is a great way of getting a wider audience for your podcasts or literally any audio or visual output you have planned. If people like what they see and/or hear, they’re going to want to know more so make sure that the content has a call to action at the end of it and has relevant branding so that your audience know who created it and how they can learn more. Although Twitter has introduced ads, its organic timeline and real-time trends give brands far greater opportunity to achieve visibility than on Facebook. Again it takes creativity when it comes down to being creative and tweeting regularly. With Twitter it is far easier to identify who is in the mood to engage, meaning if you are thinking real-time a few tweaks and some quick thinking can give a massive boost to your engagement if you have identified the right people. As already noted above, as more and more get engaged in the social debate, so the organic channels clog up, making visibility only certain with some paid social investment. Yes, clever content, cleverly placed can and is very likely to engage, but paid social gives you the opportunity to pretty much guarantee some interest. Consider it as something of a safety net and doing social smarter. With a minimal investment any sized business can compete strongly for highly-targeted audiences. Twitter advertising and Facebook advertising can work for just a few pounds per week, so it really is affordable whatever your budget. Visuals work. It’s no surprise that the introduction of Twitter Product Cards has proven popular with forward thinking ecommerce businesses. The same is true in respect of innovative campaigns on Pinterest and Instagram. You can sell using social media and you can sell direct, so why aren’t you? With the rise and rise of mobile, people could be literally one click away from using Twitter to going through your checkout process and making a purchase. Buying has never been simpler. Don’t think social commerce is the preserve of big business with big budgets. In practice it is the smaller boutique retailers who are able to engage greater and show their personality in the social commerce field. Social media is set to drive successful online business in 2015. The most successful of those will be the trailblazers riding on the crest of the wave that trends produce. The six growth areas above offer the perfect focus to ensure your content and strategy will be in line with the trends of the coming year, whatever the size of your business. Good luck and let us know how you get on.